Arthroscopy: Arthroscopy is a keyhole surgical procedure orthopedic surgeons use to visualize, diagnose, and treat problems inside a joint. Some problems associated with arthritis also can be treated. Initial tests for these types of problems usually involve the use of imaging studies such as X-rays, computerized tomography (CT) scans and magnetic resonance imaging (MRI) scans. However, if these tests don't find anything it may be necessary to take a direct look at the inside of the joint. An arthroscopy can also be used to assess the level of joint damage resulting from an injury, such as a sports injury, or from underlying conditions that can cause joint damage, such as osteoarthritis - where, over time, the joint cartilage becomes damaged. 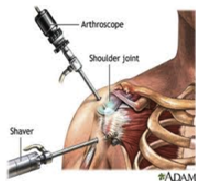 In an arthroscopic examination, an orthopedic surgeon makes a small incision (about the size of a buttonhole) in the patient's skin and then inserts pencil-sized instruments that contain a small lens and lighting system to magnify and illuminate the structures inside the joint. Several other incisions may be made to see other parts of the joint or insert other instruments. 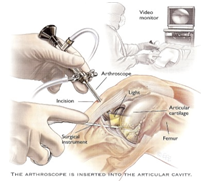 By attaching the arthroscope to a miniature television camera, the surgeon is able to see the interior of the joint through this very small incision rather than a large incision needed for surgery. The surgeon can determine the amount or type of injury and then repair or correct the problem, if it is necessary. You will be given a general, spinal, or a local anesthetic, depending on the joint or suspected problem. After arthroscopic surgery, the small incisions will be covered with a dressing. You will be moved from the operating room to a recovery room. Many patients need little or no pain medications.The amount of surgery required and recovery time will depend on the complexity of your problem. Occasionally, during arthroscopy, the surgeon may discover that the injury or disease cannot be treated adequately with arthroscopy alone. The extensive "open" surgery may be performed while you are still anesthetized, or at a later date after you have discussed the findings with your surgeon. Such as stiffness and swelling in the affected joint, are usually minor and temporary. Excessive pain in the following arthroscopic surgery is usually due to over activity of the joint before the muscles have been adequately strengthened. Excessive swelling can also cause pain. Lasting pain is another common side effect of arthroscopy. Medication:. Your doctor may prescribe antibiotics to prevent infection, as well as medication to relieve pain and inflammation. It is normal for some blood to collect under the dressings. It is also normal for the knee to develop some bruising after surgery. A temperature of 100.4 degrees Fahrenheit (38 degrees Celsius) or higher. First 4 weeks you will walk with support of brace. 2nd month can walk normally without any brace and you have to do your stretching exercises. Strengthening your muscles is important in restoring function to the joint affected. The physiotherapist at the hospital will have shown you how to do these exercises. You should continue them on a regular basis for several weeks after the operation. Don't play any contact sports, such as football, for at least 9 months after your operation. After that seek advice from the surgeon. A patient's physical therapy program after arthroscopy can be divided into three phases: regaining control of the leg muscles and weaning from crutches, regaining full motion and strength and returning to normal activity. The rehabilitation program depends on the joint and extent of the procedure performed. Lay on your back on a flat surface. Place a rolled towel under your ankle between you and the surface. Push your ankle down into the towel roll. This will cause your knee to straighten as it raises off the surface you are laying on. Straighten your knee as much as possible and hold the position for five seconds. (Avoid any type of bouncing motion!) Relax and repeat 10 more times. Push your ankle down into the towel roll. This will cause your knee to straighten as it raises off the surface you are laying on. Straighten your knee as much as possible and hold the position for five seconds. (Avoid any type of bouncing motion!) Relax and repeat 10 more times. Lie on your back with your knees bent in a 10 to 15 degree angle. Without moving your leg, pull your heel into the floor. This will cause the muscles on the back of your thigh to contract. Hold this for five seconds. Relax and repeat 10 more times. Lie on your back with your knees bent in a 10 to 15 degree angle. Squeeze your buttock muscles together. Hold for five seconds. Relax and repeat 10 more times. 2-7 days of rest is required after the surgery. Most people are able to return to work one or two weeks after the operation. So plan accordingly and arrange for leave Follow your surgeon's advice about returning to work and leisure activities. Patients are able to shower when they receive the confirmation that it is okay to do so from their doctor. Patients may be asked to cover their leg with plastic to avoid wetting the bandage and incisions, which increases the chance of infection. Patients may drive a car as soon as they have good control and mobility of the knee. When patients can comfortably put full weight on their leg, and have good muscular control, they may discard their crutches. Avoid driving until you are on pain medications. After surgery, an exercise program is gradually started that strengthens the muscles surrounding the joint and prevents scarring (contracture) of surrounding soft tissues. The goal is to recover stability and strength of the joint rapidly and safely, while preventing the build-up of scar tissue. This program is an essential part of the recovery process for an optimal outcome of this procedure. Your range of motion for the joint or limb in question may be restricted. For knee, squatting is prohibited. 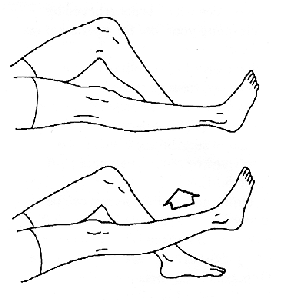 Similarly for other joints some movements may be prohibited as they can cause injury pain. The healing of the surgical area depends on your nutrition status and overall health. Hence an adequate balanced diet is important for speedy recovery. A dietician can help you guide a balanced diet. It is best for patients to eat a light, soft, and cool diet as tolerated once recovered fully from the anesthetic. Hot liquids should be avoided for several days. Even though the individual may be hungry immediately after surgery, it is best to proceed slowly with food intake to prevent postoperative nausea and vomiting. Occasionally, the person may vomit one or two times immediately after surgery; if vomiting persists, the doctor can prescribe medication to settle the stomach. It is important to remember that a good overall diet with ample rest promotes healing.